Anna Sui, 2011 © Anna Sui. Gigi Hadid modelling the Polynesian Collection, Spring Summer 2016. The print on the dress modelled by Gigi Hadid was commissioned from Zandra Rhodes and the models also wear wedge-heeled Hush Puppies shoes, which highlight Sui’s ability to make strategic partnerships with kindred designers and manufacturers. Image © Jennifer Graylock. I cannot remember the first time the media introduced me to Anna Sui, but I do recall specific stories about her: with her famous ‘90s supermodel friends like Linda Evangelista and Christy Turlington, or fashion industry colleagues like Steven Meisel and Marc Jacobs—or most notably, mentions about her genius files where she saved magazine pages or old TV Guide covers to inspire her collections. I also recall articles about Anna Sui which claimed that she visited the New York City flea markets on occasion to shop for herself or to get ideas for future collections. I saw her a few times at said flea markets and couldn’t believe it was true! I was too shy to approach her for a photo or autograph. 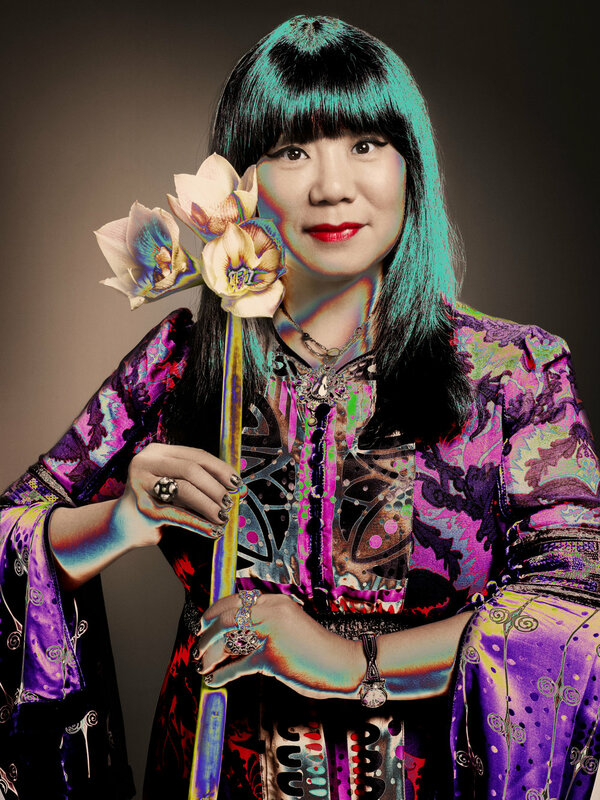 But this new show in London, “The World of Anna Sui,” the first-ever retrospective of an American fashion designer in the UK, is likely the closest I’ll ever get to her and understanding her creative process. Yes, I’m a total fangirl of Sui, and I have collected bits and pieces of her various collections over time (one of the best parts of living in New York City were her sample sales held on location at her office showroom in the Garment District). Her vintage-inspired, quirky, colorful, rock-and-roll inspired designs have been standout pieces in my wardrobe and note to Mari Kondo: they all spark tremendous joy, so I won’t be donating them anytime soon. In fact, some of these favourite pieces are in the slideshow of this article. This current exhibition—fittingly in London—presents a range of Sui’s earliest works from her Carnaby Street schoolgirl outfits in 1991 to her recent cowboy and cheerleaders looks modelled by Gigi and Bella Hadid during her Spring/Summer 2017 Americana-themed show. Arranged according to various themes, the exhibition shows a vast spectrum of motifs featured in Anna Sui’s collections which include the rock star, the school girl, punks, nomads and surfers. Likewise, in the space of the exhibition is a recreation of Anna Sui’s flagship store in SoHo, New York City. If you have never been to the original store, it is a must-see for any fashion lover, especially one who appreciates funky interior design: purple walls, black accents, red floors and Aubrey Beardsley prints create the ideal punk-inspired, thrift store chic environment. And if you’re in the actual store, chances are the music will be good, too! In other words, for someone like me (a lifetime collector and admirer of Anna Sui), this is a dream come true. "The World of Anna Sui" opens at the Fashion and Textile Museum in London today, May 26, 2017.